Everyone has heard all of the “horror” stories associated with Craigslist. To be perfectly fair, it’s probably not just to call them “Craigslist” horror stories; I think “internet” horror stories would be more precise. 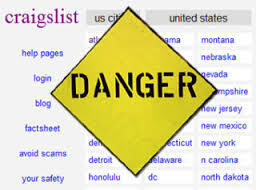 The truth is that anytime you put your personal information “out there” you are taking a calculated risk and Craigslist is just one of many convenient places for predators to do their particular brand of “shopping”. If you had the time (and inclination) to do a little research you would find literally thousands of stories of what can happen when meeting an internet “friend” that is, in reality, a complete stranger. Regardless of why you would meet someone that you know only from the internet you are taking a huge risk. If you do, however, decide to meet someone there are precautions that you should take to ensure your personal safety. 3. Insist to meet at a public place such as a police precinct. 4. Do not meet in a secluded area. 5. Do not invite strangers into your home, and do not go to theirs. 6. Be cautious when buying/selling high value items. 7. Perform the transaction during daylight hours. 8. If it sounds too good to be true, it normally is. 9. Tell a friend or family member about your intentions. 10. Take your cell phone with you.